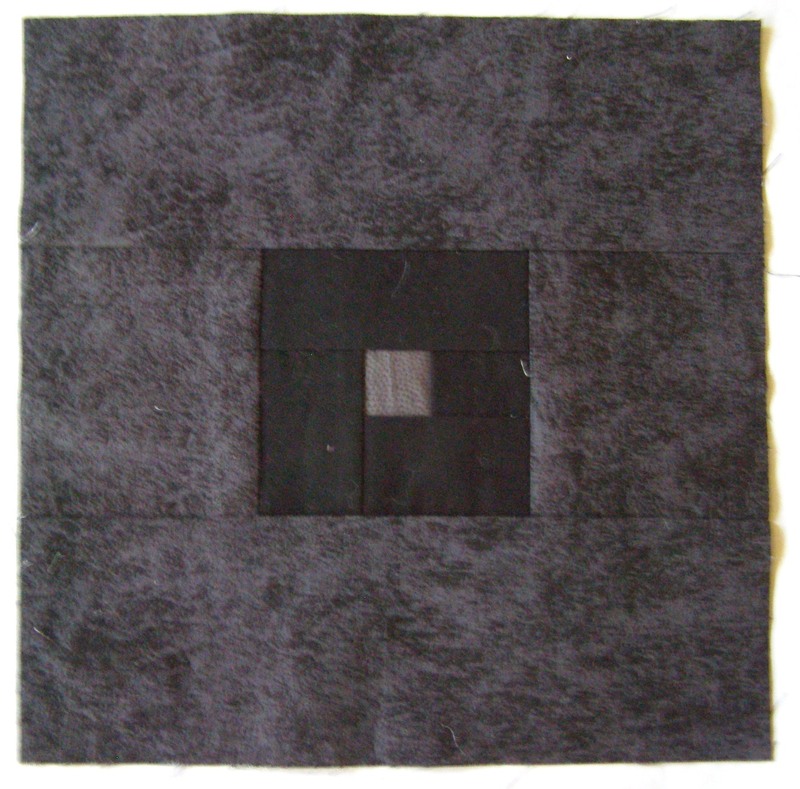 The 16th and final block for the MMQ is a simple 1″ square in the middle of the 4″ center design block. 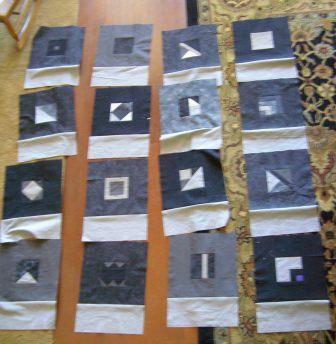 Once all 16 squares are complete – it is time for sashing. Sashing is the fabric that is sewn between the squares. The MMQ will have 4″ wide sashing with 1/2″ seam allowances, so will be rotary cut to 5″ wide. Five 5″ wide strips were cut across the width of the fabric. Sew sashing fabric to lower edge of squares. 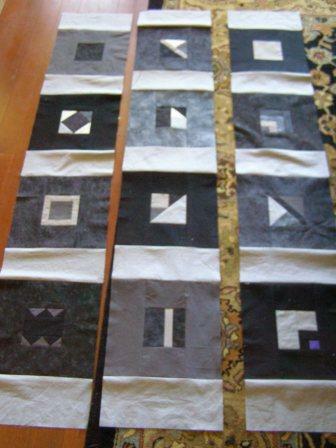 Using rotary ruler and cutter, “square” the sashing to the same 11″ width as the squares. Laying out squares on floor – Take a Picture! 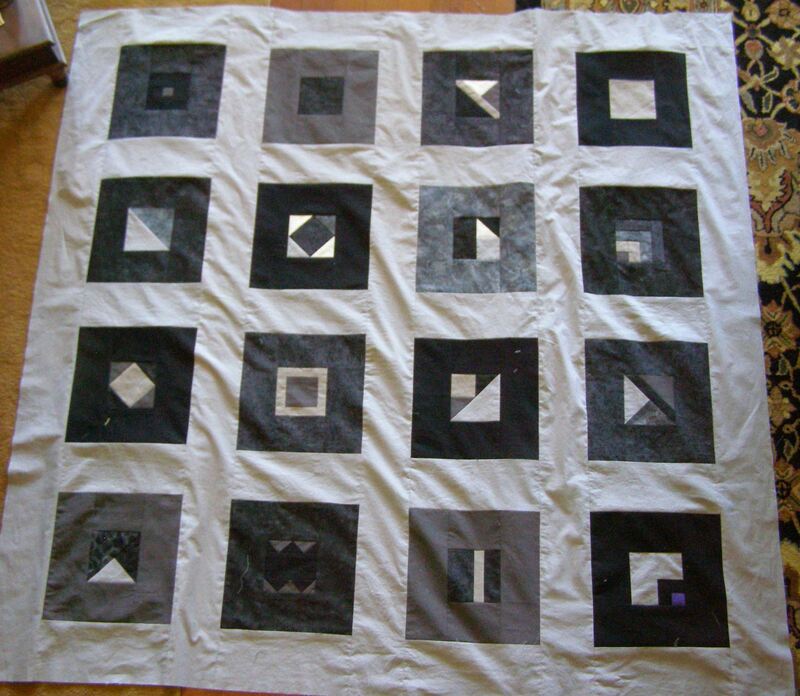 Lay out squares (with sashing sewn to bottom) to determine arrangement. For the MMQ, no two matching borders or designs could be adjacent. Now, this may seem silly, but it is important – Take a Photo. Use a camera or a cell phone, but once all the squares are laid out – Take a Picture! Although we would all like to think we can remember which square goes next to which other square – after picking squares up and carrying them to the sewing machine, I can’t even remember if the seam goes along the top or the bottom! Squares sewn into vertical strips. Then sew the squares into vertical strips and add sashing at the top of the strips. Press seams. Cut five 5″ strips the length of the strips plus some (about 6″) extra. To help keep the quilt top square while sewing these long seams, I do the following. Along the long edges of each strip, place a small mark where each of the square’s seam should be placed. I use a red pencil and mark within the 1/2″ seam allowance, so it will not show after stitching. 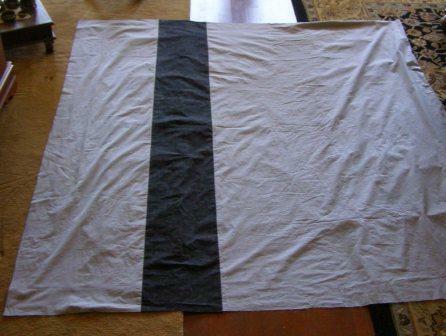 Place a mark at 8″(first sashing plus a little extra), then another 10″ (the first square), then 4″(sashing), then 10″ (second square), then 4″ (sashing), etc..
Red marks on long sashing piece match to seams. Pin the sashing to the vertical strips of squares matching these red marks to each seam. Press seams. Use rotary ruler and cutter to trim excess sashing. And – the quilt top is complete! YAY! The quilt back requires only a few seams, and it is ready for the trip to the Long Arm Quilter. I am thinking I will request the quilting be stitching in a “W” or horizontal zigzag pattern. Comment on Color (or lack thereof): Sewing a grey/black monochromatic color-scheme was very challenging – I love the little purple square, but would have preferred MUCH MORE COLOR! This entry was posted in Beginner Sewing Projects, Home Decor, Modern, Quilting, Sewing, Sewing for a Teenager, Stash Couture, Tutorial. Bookmark the permalink.